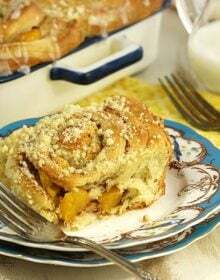 Make ahead Peach Cobbler Cinnamon Rolls are drizzled with a lemon glaze for brunch and breakfast perfection. Mix the brown sugar, cinnamon, salt and nutmeg in a separate small bowl and set aside. Turn the dough out onto a lightly floured surface and press the dough into a 16 by 12 inch rectangle. Spread the butter over the entire surface of the dough and then sprinkle the brown sugar mixture over the butter leaving a 3/4 inch border along the top edge. Press down on the sugar mixture to adhere it to the butter. Spread the peaches evenly over the sugar mixture. In a small bowl, blend together the powdered sugar, flour and butter with a fork until pea size clumps form. Sprinkle the streusel mixture over the rolls. In a small bowl, whisk the powdered sugar, milk and lemon extract together until thick and smooth. To freeze: After arranging the rolls in the baking dish, cover loosely with greased plastic wrap and let rise in a warm place until the rolls have doubled in size, approximately 1 hour. Wrap the dish tightly without pressing on the rolls and freeze up to 1 month. To bake, preheat the oven to 350 degrees. Unwrap the rolls and wrap tightly with foil. Bake the rolls for 20 minutes and then remove the foil and continue baking until golden, an additional 30 minutes. Turn out onto a wire rack, cool and ice as directed.